Located just outside of Portland Maine, the coastal suburb of Falmouth is a great place to live, work and raise a family. The population of Falmouth is about 12,000 and the town covers roughly 30 square miles, which affords residents with the perfect combination of community and privacy. Falmouth is very popular because of its coastal culture. 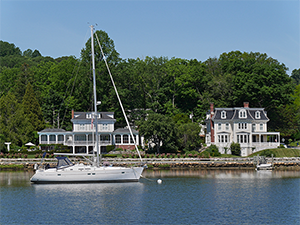 While Falmouth is a great place to live year-round, it is busiest in the summer when visitors and seasonal residents come for the area’s great sailing, fishing, and beaches. There are also several excellent golf courses in the area, including Portland Country Club and the Woodlands Club. For families with children, the local school system in Falmouth is considered among the best in the state. Children in grades K-5 attend the newly built Falmouth Elementary School, and older children attend Falmouth Middle School and Falmouth High School. Scroll down to view all real estate in Falmouth, Maine. Find the most up-to-date properties on the market, including oceanfront homes as well as properties close to major highways for easy commuting to the city. Call us at 207-784-2525 or contact us online for more information or to schedule a private showing.